Do Wah Diddy has been in business since 1981. However, we started collecting cool old stuff from the past, when we were married in 1967. We couldn't afford new furniture, so we hung out at the swap meets and junk shops, picking up stuff that caught our eyes. This rapidly became an obsession as we researched the items we were attracted to and became knowledgeable about the different styles and periods. By 1980, we had so much stuff we knew we had to make a decision: We either had to see a doctor about our problem or start a shop. We chose to start a shop. We opened Do Wah Diddy at 3642 E. Thomas Road in Phoenix and enjoyed 23 great years dealing in our favorite periods: The 1930s thru the 1970s (we both grew up in the 1950s and 60s and have a special fondness for these two decades). In 2003 we decided to make a move to a smaller community (we grew up in Phoenix and missed the small town feeling of our childhood). We purchased 3 1/2 acres in the beautiful rolling hills of Dewey, Arizona (about 85 miles north of Phoenix). We call our spread "Flamingo Acres". We have built a warehouse on our property and continue to do what we love to do: Collecting and selling 20th Century Pop Culture and enjoying the many blessings God has given us. We are no longer open to the public, however you are welcome to visit our warehouse. Just call to schedule an appointment. 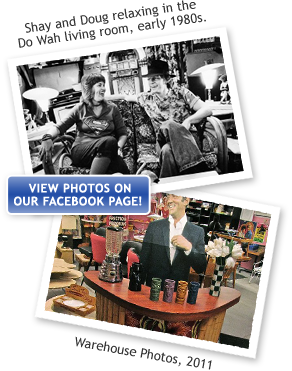 And don't forget to check out some photos of our days in the Phoenix store, just visit our Facebook page!